Castellon is just too small for me. Although I love small cities over large ones, when you are a single woman it can become just to cozy. This weekend is the San Juan celebration which is where everyone lights beach fires all along the coast. 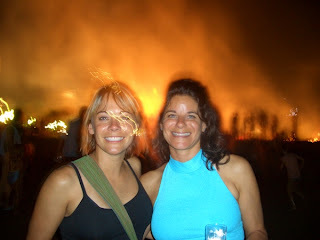 Hilary and I went to this last year (photo) with some friends and had a good time which of course lasted all night long. I think I was the last one to crawl back to our friend’s apt. …some time after sun-up the next morning. Well, I was going to go to them again this year with friends and Robert, but after reflection on my time in Castellon, I realized that I am not ready to see or run into guys I have dated the past year and a half. Now it’s not like I have utilized all available dateable males, but it already feels like I am in high school because everyone knows each other and though I have not gone out (ranging from coffee to a short relationship) with tons of guys they all have too many gossipy friends. Like Colwich Kansas, those who remain in the town keep in touch with everyone personally or through the grapevine. There are stories similar to that one, but I really don’t want to relive them. It’s not that the stories are sordid or shocking, but guys gossip just as much as girls and no one can convince me otherwise. I am only in Spain for another 2 weeks and I want my time here to be relaxed and not complicated by anything, especially not jealous or pursuing guys…or one of their friends.